when first the glorious Lady of my mind was made manifest to mine eyes; even she who was called Beatrice by many who know not wherefore. 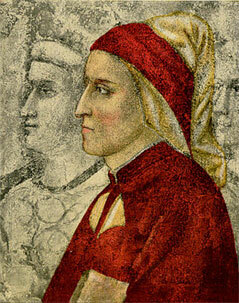 Beatrice, however, went on to wed another, and died suddenly in 1290; Dante tried to forget his disappointment and grief in battle, fighting in the wars against Arezzo and Pisa, then in writing his revolutionary ‘autopsychology’ La Vita Nuova. Like the other great poets of Florence’s literary awakening, Guido Calvacanti and Foreses Donati, Dante was a keen student of Bruneto Latini, who urged his followers to strive for excellence and fame and, with Aristotle and Cicero as their models, to use their talents to serve their city state, Florence. 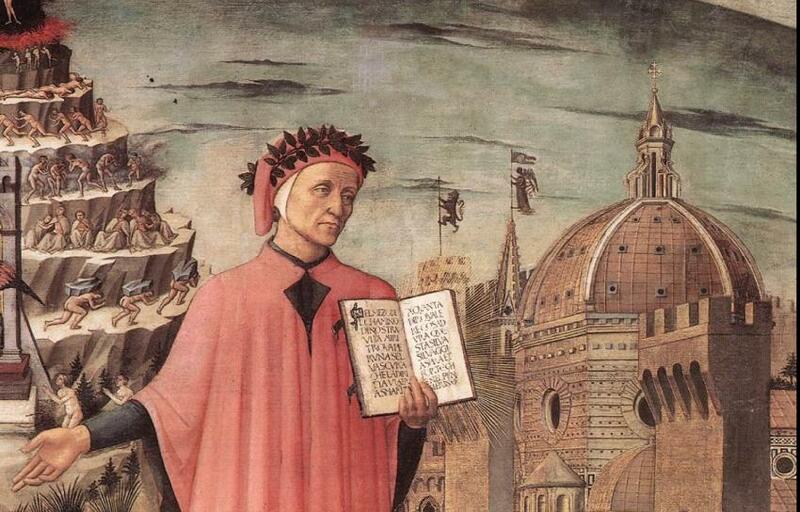 In 1302, as a White Guelph, Dante was exiled from his beloved city; a friend just managed to rescue the manuscript of the Inferno from the crowds who came to sack and pillage his home. His exile, although mostly in the palazzi of rich patrons, was hard to bear, ‘Bitter is the taste of another man’s bread...’ as he wrote in the Paradiso. In The Divine Comedy, Dante interwove his personal trials and solutions with the trials then facing Italy, all set against the poem’s great allegory of the fall of man, as his protagonist (generally understood to be himself) is exiled from God in the Inferno, spiritually awakened in Purgatorio (where he put most of Florence’s great poets and painters) and finally, led no longer by Virgil but his beloved Beatrice, fulfilled by union in the city of heaven, beyond the nightmare of history and beyond his very self. Dante was never allowed to return home, and died in Ravenna just after the completion of his masterpiece in 1321, where the city boss Guido Novello da Polenta, nephew of the famous Francesca da Rimini, had taken him in. To the end, Florence was never far from his mind, and he refers to the city, its monuments and events from his life there all through the Commedia.